To set up a screening of Boom, please email us here! San Francisco, CA: Friday, June 11, 8pm at the Artists' Television Access - 992 Valencia (at 21st.) Benefit Screening for the Eviction Defense Collaborative / $5.00 + donation to EDC, sliding scale. 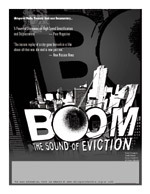 Boom's World Premiere was on November 4 & 5, 2001, at the Roxie Cinema.We had a Benefit for the Redstone Tenant's Association and the Mission Anti-Displacement Coalition (MAC). Santa Cruz, California: February 28th, 2002, Kresge Hall, UC Santa Cruz campus. Presented by RASCALS Student Group. Berkeley, California: April 22-24, 2002, Fine Arts Cinema. Madison, Wisconsin: June 15th, 2002, Electric Earth Cafe, Presented by Brian Standing. Los Angeles, California: October 13, 2002, on the campus of USC. Presented as part of "Race in Digital Space" Conference and Exhibit. Los Angeles, California: November 22, 2002 at Flor y Canto Lincoln Heights Youth Community Center. Asheville, NC: Thursday March 25th, 2004 9pm at the Fine Arts Theater - 36 Biltmore Ave. Benefit Screening for the Asheville Community Resource Center - Advance tickets - $5 - $20 sliding scale, available at 828.254.5580.